(APN) ATLANTA — On Tuesday, April 18, 2017, Glenn Carroll, Director of Nuclear Watch South (NWS), filed a request for an emergency public hearing with the Georgia Public Service Commission (PSC) to seek relief for ratepayers from the Construction Work in Progress (CWIP) tax on customers’ electric bills. 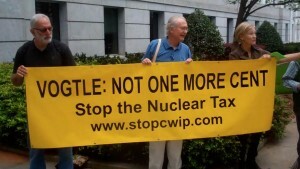 Georgia Power ratepayers have been paying in advance for the construction of Plant Vogtle nuclear reactor units 3 and 4 since 2009, because of the Georgia Legislature’s approval of CWIP via Senate Bill 31, which subverts the traditional ratemaking process and undermines the notion of Georgia Power shareholders taking any risk. Nuclear Watch South also seeks for the PSC to cancel construction on Vogtle 3 and 4 because they are not needed. After filing the request, Carroll rushed downstairs to hold a quick press briefing on the filing. The press briefing was attended by more police than reporters. Before the press briefing got started, three Capitol Police cars rolled up and a half dozen officers jumped out to demand that the small group move from the public sidewalk at 244 Washington Street to Liberty Plaza. Carroll informed the Capitol Police that she just filed a request for an emergency hearing with the PSC and that Reece McAlister, PSC Executive Secretary, was aware of the press briefing, and had not objected. One officer then went inside to check with the PSC and when he returned the press briefing was over. Rogers threatened Coffin with arrest if she did not stop. “I think it’s my First Amendment right and my taxes pay for this. I don’t think they have authority over the sidewalks,” Coffin told Atlanta Progressive News. NWS’s emergency public hearing was prompted by Vogtle’s main contractor, Westinghouse, announcement of bankruptcy, which already puts the project’s completion in question. Georgia Power has already canceled plans for additional nuclear reactors in Stewart County below Columbus, Georgia because of the bankruptcy. Georgia Power recently announced that those plans, which were previously put on hiatus, have been cancelled for good. A public hearing could help to answer the many questions ratepayers want to know. The public has a right to know the true cost to complete the project; versus the alternative cost to cancel the construction and instead meet consumers’ energy needs with renewable sources like solar and wind. The complete and true construction schedule has not been public for years, and customers need to know if there is an end date. NWS has testified that Vogtle 3 and 4 are not needed as a generating source, relying in their conclusion on Georgia Power’s own annual report, which shows the company has been experiencing a downturn in sales and a large excess capacity for the past ten years. Georgia Power has not refuted NWS’s analysis. Vogtle, if completed, would add six percent capacity to Georgia Power’s already bloated portfolio. “Georgia Power has been making a risky high-stakes bet on nuclear energy with the public’s money and we need to stop the hemorrhaging of public money for the unneeded, deeply troubled Vogtle project,” Carroll said. So far, the average electric customer in Georgia has paid over five hundred dollars into CWIP. The PSC ignored all the red flags raised by environmental groups and ratepayers. Now Vogtle 3 and 4 are four years behind schedule, four billion dollars over budget, and the project is only 36 percent complete, with more delays and cost overruns expected. Georgia Power, and its parent Southern Company, do not seem to mind these delays, as long as the PSC continues to guarantee their recovery of construction costs along with a guaranteed profit. “Their sticky fingers have been in our wallets taking our money to build their nuclear plants. This is free money to them but hard-earned money to us and it has been wrong from the start,” Robert Searfoss, a disgruntled Georgia Power customer, said. “It’s time for the PSC to pay attention to the public part of your elected office, and cut our losses with not one more cent for the Vogtle vortex,” Searfoss said. So many cops carry little copies of the Constitution with them. Yet, we never hear of a cop saying “You know what? I’m not following this order to harass people exercising their First Amendment rights because it violates the Constitution.” I guess the Nuremberg Defense is alive, well, and more effective now than it once was.